A comprehensive RFP that thoroughly covers all the critical points that can assist companies in reducing costs and producing better ROI, faster. 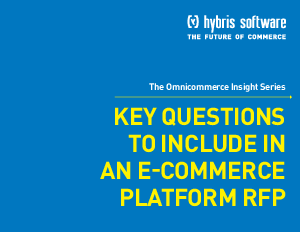 If an RFP helps a management team reach a final decision in 12 weeks rather than 16 weeks, an additional month of revenue may be added to the bottom line from the e-commerce channel. This could translate into hundreds of thousands of additional revenue dollars. And, a well-crafted RFP can ensure that a company doesn't pay a premium for features it won't need for the foreseeable future.